I told the taxi driver at Bristol station that I didn’t want to go with him because his taxi was too big. But I had no option because he was first in line. The driver was actually quite sympathetic to my concerns – based on the fact that bigger cars are less fuel efficient. But he told me he had been forced to buy a large vehicle by Bristol City Council. They have introduced laws that mean all hackney cabs in the city have to be wheelchair friendly. A laudable objective you may think. But my driver complained that this meant he had to spend more money buying his car and more again to run it. He told me that his previous saloon car did 34.7 mpg in town and 48 mpg on the motorway. His current one only does 25mpg in town and 28 mpg on motorways. That really stacks up over the 20,000 – 30,000 miles he travels in a year. I worked out that he’d be using nearly 300 extra gallons of fuel annually compared to his previous car. And if you multiplied this across the 900 licensed cabs running in Bristol it would come to about 270,000 extra gallons of fuel a year. If Bristol was full of wheelchair travellers this might make some sense. But I also learnt that in the last five and half years my driver has picked up only two people using wheelchairs. This is totally ridiculous. There are other far more carbon-friendly ways for Lib Dem controlled Bristol Council to ensure taxi availability for wheelchair users. I wonder if any of them have ever thought about the wider impacts of their regulations – they should. Let’s hope that other cities don’t follow suit. This entry was posted in About me, BLOG, Energy & Climate, News 2010, Transport - Road, Rail & Air. Bookmark the permalink. Good to read your blog again. I don't know how you have the time for it all! I've become very interested of late, in the idea of a Resource based society, as advocated by Jacques Fresco of the Venus Project. A society where money is no longer of importance. We have enough resources in the world now to feed and shelter everyone, and with the use of technologies, everyone one could share in these resources. Here's my blog, with useful links if you are interested. We live in a scarcity economy, where commodities are kept deliberately scarce, to maximise profits. It's time to leave politicians and the money men. Sounds simplistic and idealistic I know, but well, I don't see anything else really else working. Interesting article as for me. It would be great to read something more concerning that topic. The only thing I would like to see on that blog is a few pictures of some devices. I definitely want to read a bit more on this site soon. By the way, pretty good design you have at this site, but how about changing it once in a few months? A fair point Julia. But Bristol is trying to make some efforts to be a 'cycling city' as well. Would 'Smart Car' taxis work, or just encourage people to travel one up in the taxis ? They did trial some 'rickshaw' type contraptions for the student area with a cyclist towing a passenger cabin. 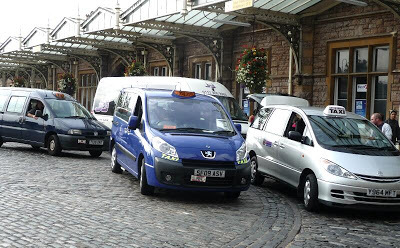 But there is also a bigger problem with Bristol taxis – they don't cover the entire Bristol 'conurbation' as the city limits stop well short of areas to the East and North of Bristol like, say, Kingswood and Bradley Stoke, which are in South Gloucestershire. So if one is a wheelchair user in those areas, well, don't hold your breath for the taxis to come to you. There is also a wider debate about how far we should preserve our heritage of cobbles on the harbourside which look great and are very 'traditional' but are a nightmare for the elderly and the disabled. But you do make a very valid point that the Disability Discrimination Act is not immune from the 'Law Of Unintended Consequences' as old buildings like Bristol South Swimming Pool, which is not accessible to the disabled is often under threat of closure as not being modern enough. It is being revamped now, but if it had closed it wouldn't benefit anyone – able bodied or disabled.